Getting out of a Thai mob family just isn’t easy when your adopted father is the Godfather. 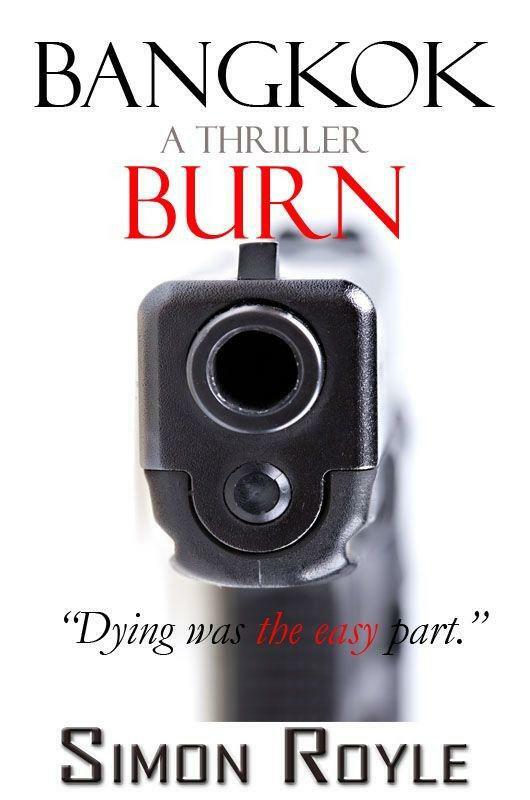 Before I get too deep into the details of this review, let me point out that Bangkok Burn is an action novel – and by that I mean that it’s a verb rather than a noun. When deciding to read this novel it’s a commitment to movement; so be prepared. From the opening bomb blast, Chance is in a race against time: to neutralise an unknown enemy, to avenge the attack on his adopted father and to find his kidnapped pseudo-uncle. The action is set against the backdrop of the Red Shirt protests in Bangkok which added a chaotic environment in which the story could manoeuver. The story is told completely through the eyes of Chance, a son of American drug traffickers, adopted by a Thai crime family when still a child. Chance is completely assimilated into the Thai culture and the author not only tells this story from Chance’s point of view, but also with his voice. The voice of the narrative really requires a bit more discussion as it is clear that some effort has made to reproduce a Thai ‘feel’ to the storytelling. Of course compromises were made so that the story remains readable but there is a drop of the plural in places and a number of paragraphs broken into short sentences which gives the impression of broken English without producing a facsimile. For me, although I appreciated the effort made to walk this fine line, I still had some comprehension issues from time to time, some more problematic than others. It also made it a bit difficult to isolate errors from deliberate Thai-isms. Personally, I would have preferred this element to have been sacrificed to further enhance readability. There’s quite a lot to look forward to in this story if you crave entertainment: multiple assassination and kidnapping attempts, acts of revenge in weird and wild forms, a crocodile farm that can’t seem to stay in the background of the story, crosses and double-crosses, romance which takes centre stage for a while in an unpredictable twist and enough action to pack into a season of “24” on television. You would have to be a corpse not to feel the adrenalin rush in some parts of this novel. Additionally, as a reader (a foreigner according to the narrator) we get a view of the seedier side of Thailand where people smile quite genuinely while going for the throat; where wives are just as deadly as their husbands, and every gathering is a multi-faceted puzzle of plotting and manoeuvring veiled by impeccable politeness. It’s this aspect that gives birth to some interesting characters, most notable of which is Chance’s adopted mother. In many ways Mother is the power behind the family and it’s impossible not to be impressed by her. I was completely besotted by her capability, her ruthlessness and her fierce maternal affection for Chance. It’s pretty easy to tell that I had a lot of fun with Bangkok Burn. It concentrates on setting the reader a blistering pace; it attempts to expose the reader to a treacherous Thailand where everything and nothing is what it seems; and it twists and turns through its many conclusions – false and otherwise – to the cacophony of a particularly tumultuous time in Thailand’s recent history. It deserves every star of the four I’m giving. This entry was posted in 4, Action, Novel, Reviews and tagged Action, Crime, Thriller. Bookmark the permalink.